Oral solution: Monodose vial of 2 ml: Box of 1. 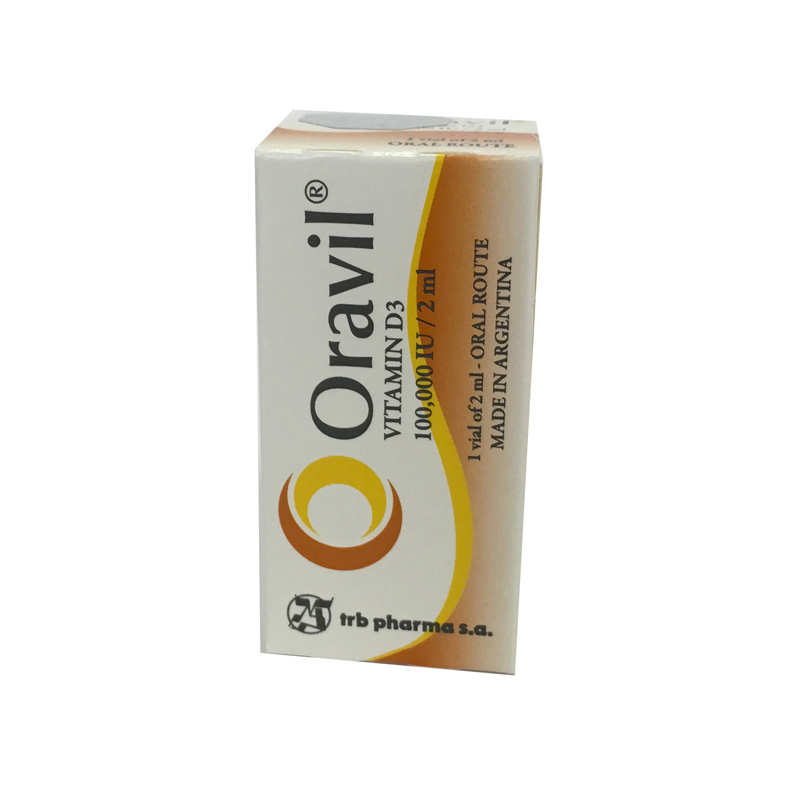 Each vial contains: Cholecalciferol (Vitamin D3) 100,000 IU. Excipients: Vitamin E, Butylhydroxytoluen, Saccharin, Corn Oil, Orange essence, Lemon essence. Prevention and treatment of vitamin D deficiency: rachitism, osteomalacia. It is also indicated for the prevention and treatment of osteoporosis in patients with inadequate dietary Vitamin D and/or calcium intake. Hypercalcemia, hypervitaminosis D, renal osteodystrophy with hyperphosphatemia. The risk- benefit ratio must be assessed in patients with: Arteriosclerosis, heart failure, hyperphosphatemia, hypersensitivity to vitamin D, renal disease and sarcoidosis. The margin between the therapeutic and the toxic dose is very narrow. Dose adjustment must be done immediately after a clinical improvement is observed. This drug must be taken under medical supervision. Dietary intake of vitamin D fortified foods must be readjusted in order to avoid overdose disorders caused by vitamin D or its analogs. Use in pediatrics: Children, who receive a long term 1,800 IU daily dose of vitamin D, may experience growth failure. This drug must be taken under strict medical supervisions with pediatric patients. Use in elderly patients: The response of elderly patients to vitamin D and its analogs is comparable to that of young adults. Patients under anti-seizure therapy: Patients under anti-seizure therapy may require vitamin D supplementation to prevent osteomalacia. Bisphosphonates (such as pamidronate among others), gallium nitrate and plicamide, used for the treatment of hypercalcemia may antagonize the effects of Vitamin D.
Antiacids based on aluminium salts reduce the absorption of liposoluble vitamins, such as vitamin D.
Barbiturates and anti- seizure drugs may reduce the effect of Vitamins D due to the acceleration of its enzyme-induced hepatic metabolism. In hypercalcemia therapy, Vitamin D may antagonize the effects of calcitonin if they are given together. The administration of thiazide diuretics and calcium preparations together with vitamin D may increase the risk of hypercalcemia. Cholestyramine, cholestipol and /or mineral oils reduce Vitamin D intestinal absorption; therefore, if it is necessary to co- administer them, the dose of Vitamin D must be increased accordingly. In digitalized patients, the co administration of Vitamin D may cause arrhythmia, in the same way as the co- administration of Vitamins D with phosphate-containing salts may increase the risk of hyperphosphataemia. Pregnancy: no effects have been observed with the intake of vitamin D daily requirements. However, the ingestion of excessive amounts of vitamin D may pose a risk both for the mother and the unborn child. Pregnant women with hypersensitivity to the effects of vitamin D may experience hypercalcemia, hypoparathyroidism and breastfed children may experience a particular facies syndrome, mental retardation and congenital aortic stenosis. Lactation: although small amounts of vitamin D metabolites can be found in human milk, no effects have been observed in human beings with intake of normal daily requirements. Some breastfed children may be hypersensitive even at low doses of Vitamin D.
The excessive intake of Vitamin D, either in a single dose or in long term treatment may lead to severe intoxication. Hypercalcemia induced by Vitamin D chronic administration may cause a generalised vascular calcification, nephrocalcinosis and calcification of other soft tissues, which may result in hypertension and kidney damage. The effects may appear mainly when hypercalcemia is accompanied by hyperphosphatemia. Vitamin D intoxication may cause death as a result of kidney or vascular damage. Doses causing toxicity may vary according to each person’s sensitivity. The adverse reactions observed more frequently are: constipation (more frequent in children), diarrhea, dry mouth, headache, increased thirst, anorexia, nausea, vomiting, tiredness. In severe cases: bone pain, hypertension, nebulous urine, pruritus, muscle pain, weight loss and /or seizures. Prevention of rachitism in children up to 5 years old: one monodose vial every 3 months until the child is five years old. This dose may be doubled if the child is exposed to sunlight or in children with highly pigmented skin. Do not exceed 10-15 mg/year (that is, 4-6 monodose vials per year). Vitamin deficiency prophylaxis in children and adolescents: one monodose vial every 3 months during a period with little exposure to sunlight. Vitamin D deficiency prevention in pregnant women: one monodose vial administered only once towards the 6th month of pregnancy. Vitamin D deficiency prevention in adults and elderly people: one to two monodose vials per month. Mode and route of administration: Oral administration. The content of the monodose vial may be administered either in pure or in a slightly diluted from in water (it may become slightly turbid) or in the milk bottle. Hypervitaminosis treatment consists in the immediate discontinuation of vitamin D, low calcium diet, abundant ingestion of liquids, urine acidification during detoxification and support treatment. Additional therapeutic measures include the administration of citrates, sulphate, phosphates, corticoids. EDTA and mithramycin. In case of accidental overdose and if the patient experiences a hypercalcemic crisis, carry out IV rehydration with physiological saline to increase calcium secretion, and add loop diuretics if necessary. Store in a dry area. Protected from light at 15 to 30°C.